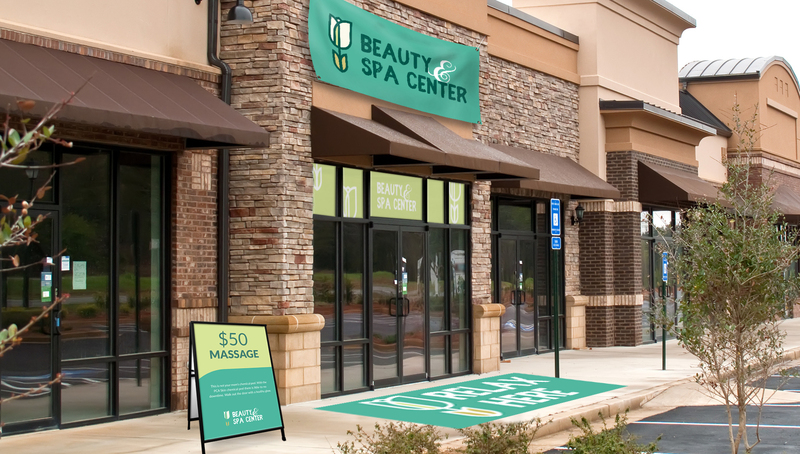 Give your storefront a visual boost with some head-turning signage, like a custom Window Cling, Outdoor Floor Graphic, A-Frame Sidewalk Sign, or a Vinyl Banner. When you’re running a small business, the truth is that you’re oftentimes wearing a lot of hats. As a business owner, you have to have the pulse on all the moving parts of your entity. Which, let’s be honest, can be a bit overwhelming. In an effort to make things a bit easier, we’re going to break down some simple solutions to the common small business marketing problems of time, money, getting noticed. Inventory. Production. Sales. Expenses. Your “to-do” list as a small business owner probably feels never-ending at times. But, don’t make the mistake of getting so wrapped up in your day-to-day operations that you neglect all marketing, promotion, and advertising. Establishing a consistent routine with marketing and promotion is key. Let’s emphasize that one more time: consistency is key! So, if you’re feeling pressed on time and resources, start small. Set aside an hour or two at the beginning of each week to create and execute even modest amounts of promotional activities. It may not feel like much at first, but starting small and staying consistent over time can really start to add up. Depending on what stage your business is in, it can be super helpful to hire out some of this work. Even if you aren’t able to commit to bringing on a full-time employee, hiring freelancers on a per-project basis can be a cost-effective method for getting specialized work done that you may don’t have the time for. Though this adds another expense to your list of responsibilities, the amount that you’re paying could be minimal to the bump in business that working with the right people can provide. Small business owners don’t often have the luxury of large marketing budgets to play with. So, any spending that goes toward advertising and promotion should be researched thoroughly. Start with your basics. There are many promotion strategies that don’t cost anything other than the time it takes to set them up. For starters, set up the appropriate social media channels for your business. In a social media marketing study done by the digital marketing agency ODM Group, a reported 74% of consumers rely on their social media networks when it comes to making buying decisions. This means you need to use these free platforms to create a digital presence. Even if you’re a brick and mortar shop, most consumers still do research online before buying. Make sure you give them something that can pop up in their search box! Plus, when you’re ready to spend a little money on advertising, many of these platforms are already set up to help you do just that. A little online research is all you need to get started with low-spend advertising. You can also create a newsletter. Again, the initial “spend” from a newsletter comes largely from time spent. So, start small. Maybe aim to send out a quarterly newsletter at first. As you grow a subscriber list, this is a great resource to let existing customers know what’s going on and give them first dibs on any great sales or promotions you may extend. Remember: you don’t need to tap into all of your advertising and promotion channels overnight, but making the time to work this into your small business strategy could pay out in a big way longterm. Schedule it in as an item on your to-do list! While it’s good to take a look at what your competitors are doing, it’s actually in your favor to not completely emulate their every move. What makes your business stand out from your competitors? Are you more cost-effective? Do you offer higher quality? Does your production rate eclipse other business’? Nailing down what makes your business a worthwhile option over your competitors is a great way to get noticed in the right way. Once you’ve done a little research, back up your unique business points with some visual assets. For online graphics, look to using free, easyto- use design platforms like Canva to help walk you through some good looking visuals. And, for your brick-and-mortar shop, look at customizing signs to draw passersby in, like a sidewalk sign or a unique floor graphic. We offer an easy-to-use builder and free design services to make customizing signs hassle-free for you at a low cost. Time, money, and getting noticed: every small business has had to grapple with these issues at one time or another. The reality is that each of these problems can be tackled by starting small, planning ahead, and staying consistent.